It is now a week to the day since Major General Muhammadu Buhari (Rtd) the 15th Nigerian Head of State and the 6th to be democratically elected, announced the purported suspension of the Chief Justice of Nigeria (CJN), Honourable Justice Walter Nkanu Onnoghen and contemporaneously swore in the next senior Justice of the Supreme Court, Justice Ibrahim Tanko Muhammed as acting CJN. The President informed Nigerians that he derived imprimatur from an order of the Code of Conduct Tribunal (CCT) granted on 23rd January 2019. Predictably, the President’s actions generated an outpouring of reactions most notably from the Senate President and Speaker of the House of Representatives; the major opposition candidate and former Vice President, Atiku Abubakar; the Nigerian Bar Association; as well as the international community and in particular the European Union, the United Kingdom and the United States of America. The aftereffects of the President’s actions continue to reverberate, the latest being the resolutions reached at the emergency meeting of the National Judicial Council (NJC) on Tuesday 29th January 2019, where the NJC issued a query to both Justices Onnoghen and Muhammed and referred a petition against the CCT Chairman, Mr Danladi Umar to the Federal Judicial Service Commission for investigation. The nation now eagerly awaits the outcome of the investigation by the NJC which is expected at the next meeting scheduled for 11th February 2019. In the meantime however, and consistent with any issue involving law and lawyers, diverse opinions have been, and continue to be, canvassed in favour of, and against, the actions of the President. 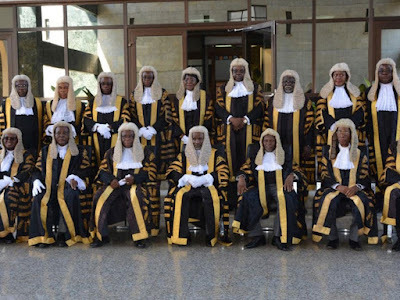 And it is against this backdrop that the present writer contends that, whether or not the allegations against the Chief Justice of Nigeria are ultimately provided to be true, the actions of President Buhari will go down in history as the most brazen act of desecration of the temple of justice since Nigeria’s independence in 1960. There is no doubt that President Buhari rode to power in 2015, on the back of a promise to tackle the evil of corruption that has bedevilled virtually all facets of the Nigerian society. What later emerged was that the modus operandi of the President would be to embark on this fight against corruption even if it meant sacrificing the well-established doctrines on which the Nigerian democracy is anchored to wit, the rule of law, supremacy of the constitution, separation of powers and respect for fundamental human rights. And more importantly, even in the face of demonstrable basis for the theory that the said fight is selective and not systematic. We first saw this in August 2015, when President Buhari while addressing lawyers at the annual Conference of the Nigerian Bar Association (NBA) directed lawyers not to represent defendants who were accused of looting the treasury. For inexplicable reasons, no informed him that it is a cardinal rule of professional conduct for legal practitioners that as a general rule, they do not reject instructions; and that it is a fundamental provision in the Constitution of the Federal Republic of Nigeria 1999 (“the Constitution”), which he swore to preserve; protect; and defend, that every person charged with a criminal offence is entitled to a fair hearing; is presumed innocent until he is proved guilty; and is entitled to defend himself in person or by legal practitioners of his own choice. Three years later, the President doubled down on this by informing the same gathering that national security trumps the rule of law. This latter statement was ostensibly uttered to provide belated justification for his administration’s serial disobedience of valid and subsisting orders of courts as exemplified by the continued detention of former National Security Adviser, Ibrahim Sambo Dasuki and the Head of Nigeria’s Islamic Movement, Ibrahim Yaqoub El-Zakzaky despite repeated rulings of courts of competent jurisdiction ordering their release. While a number of critics had concluded on the basis of clear and convincing evidence that the packaging of President Buhari as a reformed democrat in the build up to the 2015 elections was a mere sugar-coat, and some even argued that his actions are indicative of one seeking to quench a long thirst for retribution against the Nigerian judiciary against which he has harboured a decade-old, deep seated disdain, following his repeated defeats at the election petition tribunals, what no one saw coming was the extent to which he was willing to go to desecrate of the temple of justice using the instrumentality of the CCT and in particular its Chairman, Mr Danladi Umar as a willing tool. This came to a head on 25th January 2019. Before then, Nigerians woke to the reality that all would not be well with the judiciary under President Buhari when the State Security Service, self-styled DSS, invaded the homes of some Justices of the Supreme Court and the Court of Appeal and some Judges of the Federal High Court just a month to the retirement of the immediate past CJN, Honourable Justice Mahmud Mohammed. This was followed by an unprecedented delay in the appointment of Justice Onnoghen as the CJN despite a recommendation to the President by the NJC. Both the actions of the DSS and the subsequent arraignment of some of the Judges before High Courts and the CCT sharply divided opinions, so did the delay in the appointment of the CJN. In the end, the Nigerian judiciary was badly damaged by the events, but at least the office of the CJN remained sacred and insulated from the uncertainties pervading the system. It would not remain so for long. The CJN is the head of the Nigerian judiciary and until now the occupier of the office had a relatively secure job. 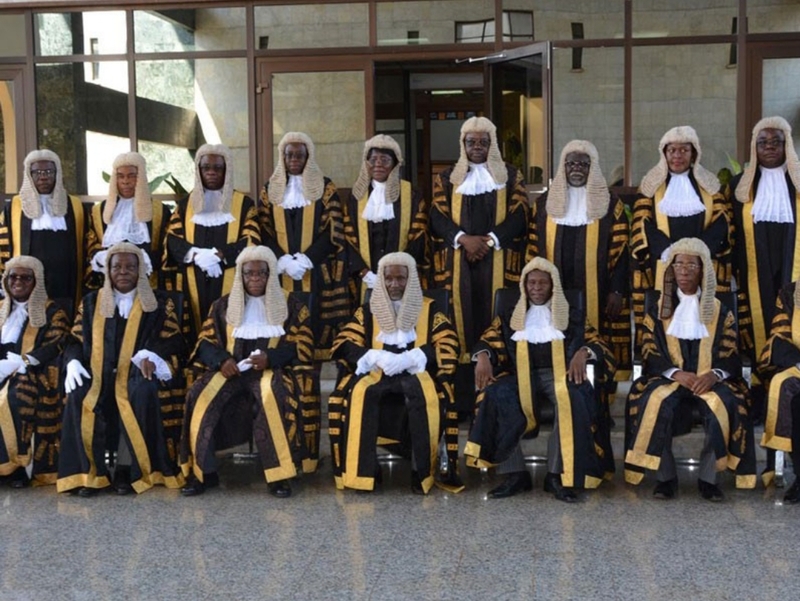 By the express provisions of Section 292 of the Constitution, and as separate courts have held, the CJN and the indeed the heads of all the courts established by the Constitution may only be removed before their age of retirement by the President or the Governor of the State acting on an address by the Senate or House of Assembly of a State as the case may be, and the NJC, being the body exclusively vested with the power to exercise disciplinary control over all Judicial Officers established by the Constitution, has a vital role to play in the process. Apparently resigned to the fact that the high threshold for the lawful removal of the CJN cannot be met, the President found a veritable avenue in the CCT. The CCT is established by the Fifth Schedule to the Constitution and conferred with the powers to determine whether a public officer has contravened the code of conduct for public officer. This raises the question whether the CCT is a court and a superior court of record at that, and whether it exercises judicial powers. A fact that often appears lost on most Nigerians is that there are fundamental differences between superior courts of record and non-superior or inferior courts and tribunals. This is not a distinction without a difference and the implication will be appreciated presently. Section 6(1) & (2) of the Constitution provides that the judicial powers of the Federation and of the States shall be vested in the courts to which the section relates, being courts established for the Federation and for the States. Section 6(5) then states that the courts listed therein are the courts in which these judicial powers shall be vested. The courts are listed in paragraphs (a) — (k) of Section 6(5). The said Section 6(5) expressly established 9 courts listed therein in paragraphs (a) — (i) while enabling the National and State Assemblies to create other courts in accordance with Section 6(5) (j) & (k). Very importantly, Section 6(3) specifically provides that the 9 courts shall be the ONLY SUPERIOR COURTS OF RECORD in Nigeria. It is instructive to note that the CCT is not one of the courts so listed. A combined reading of the various provisions in Section 6 of the Constitution lends itself to only one plausible interpretation, other courts or tribunals established, are not superior courts of record. Nigeria operates a judicial system which borrowed largely from English law as a result of our colonial history. Under both English and Nigerian law, superior courts of record possess a self-generating intrinsic source of power, referred to as inherent power and which is different from the general jurisdiction conferred on the various courts and tribunals by the Constitution or enabling law. Thus, Section 6(6)(a) of the Constitution provides that the judicial powers vested by the Constitution shall extend to all inherent powers and sanctions of a court of law. One of the major incidents of being a superior court of record is that such court is entitled to determine the question of its jurisdiction. This is not the case with inferior courts and tribunals which do not possess inherent jurisdiction but which exercise the jurisdictions and powers expressly conferred by law. Once the jurisdiction of a non-superior court of record or an inferior court or tribunal is challenged, the court has no powers to take any further steps in the proceedings, even to determine its own jurisdiction. Even in the case of a superior court of record, what emerges from the corpus of Nigerian case law is that when its jurisdiction is challenged, such court also has no powers to determine any question or make any pronouncement, except to determine its own jurisdiction. Thus on 14th January 2019, when the CCT was informed that an application had been filed challenging its jurisdiction to entertain the case against the CJN, the Tribunal, not being a superior court of record, could no longer take further steps in the proceedings. Assuming the CCT is indeed a superior court of record [it is not], it only had jurisdiction to determine its jurisdiction and nothing more. It therefore follows the entire rulings delivered by the CCT, first on 14th January 2019, and again on 22nd January 2019, and in particular the ex parte orders purportedly granted on 23rd January 2019, were all made without jurisdiction, and are in accordance with Nigerian law, null and void and of no effect whatsoever. The law on this is sufficiently trenchant and merits no rehashing. Secondly, the ex parte orders of 23rd January 2019, were purportedly granted in the face of several orders of superior courts of record, including the Court of Appeal restraining the CCT from further proceedings in the case. Flowing from the previous point, the CCT had no powers to take any arguments unrelated to the question of whether or not it had jurisdiction to entertain the charge. Thirdly, it is a settled principle of Nigerian procedural law that once a court has adjourned proceedings (particularly in open court), it can only resume hearing of proceedings on the next hearing note. In this case, the CCT had on the proceeding of 22nd January 2019, adjourned proceedings in the case to 28th January 2019 for hearing of the Preliminary Objection. Yet Nigerians were advised by the President that the CCT had granted ex parte orders on 23rd January 2019. Finally on this point, it is also a settled position of Nigerian procedural law that ex parte orders are only granted in cases of extreme urgency and in cases where it is expressly provided by law or the rules of court. Ex parte orders are an exception to the general rule and are typically filed together with a motion on notice for interlocutory orders. The essence of ex parte orders is because of the fear of irreparable damage being done between the date of filing and the date of service of the motion on notice. Above all ex parte orders are not generally granted to compel the doing of an act in view of their limited lifespan, but are granted to restrain the doing of an act to prevent irreparable harm being done. In this most curious of cases the motion on notice seeking an order to compel the CJN to step aside pending his trial before the CCT had been served and the court had adjourned proceedings for hearing, yet the President paraded an ex parte order granted on 23rd January 2019, which was granted on the strength of an ex parte application dated 9th January 2019. In other words the order had been granted over two weeks after the application was filed, and long after the motion on notice had been served. All these are determinative of the fact that the CCT had no powers to have granted any ex parte interim orders in the case never mind the one of the nature that was in fact granted. It is therefore beyond cavil that the ex parte orders purportedly granted by the CCT on 23rd January 2019 was unfaithful to both elementary logic and the foundations of Nigerian due process jurisprudence. Another factor that appears to have been lost on many is that ex parte orders are by their nature designed to last for a very limited period of time typically 7 days. The question then is now it is more than 7 days since the ex parte order was granted, is President Buhari willing to reverse his decision to suspend the CJN and swear in an Acting CJN with similar dispatch? Above all the CCT made the order in the face of a subsisting decision of the Court of Appeal that any misconduct attributed to a judicial officer must first be reported to, and handled by, the NJC and it is only after the NJC has pronounced against such officer that the prosecuting agencies of the FGN can proceed. Whether this much maligned decision of the Court of Appeal is right or wrong, same remains valid and binding on all courts below the Court of Appeal including the CCT and it is not open to the CCT to depart from it. All of the above ought to have been made known to the President by his retinue of legal advisers. Indeed no other Nigerian President in history has been surrounding by such record number of Senior Advocates of Nigeria. Instead, the President who is now notorious for selecting and obeying only favourable orders of court acted with uncharacteristic swiftness in announcing the suspension on the CJN and swearing in Justice Muhammed as Acting CJN. The legality and morality of the actions of Justice Muhammed in presenting himself to be sworn has been eloquently captured in the petition of Dr Olisa Agbakoba, SAN and is the subject of ongoing investigation by the NJC. Consequently I shall say no more on that. If only the President had stopped there, maybe his actions would not have received as much knocks as it did. The President went ahead to deliver an address that was laden with several far reaching and indeed impeach-worthy statements. After beginning his address with a reference to the yet to be commenced CCT trial of the CJN, the President curiously placed reliance on the yet to be established “suspicious transactions running into millions of dollars [traced] to the CJN’s personal accounts by the security agencies”. These suspicious transactions, the President added with magisterial authority, were all undeclared or improperly declared as required by law. This is the same President who just yesterday informed Nigerians [and rightly too] that the Governor of Kano State, Abdullahi Umar Ganduje accused of receiving kick-backs from contractors and who was caught on tape doing do, was innocent until proven guilty. The President also betrayed his inherent hypocrisy when he relied on an illegally granted order by the Chairman of the CCT who himself has been indicted of fraud and is the subject of a criminal charge instituted by the Spokesperson of the Buhari Presidential Campaign Organization, Festus Keyamo SAN on behalf of the EFCC, to suspend the CJN. The President then decried what he termed, “the sordid spectacle of a judicial game of wits in which the Chief Justice of Nigeria and his legal team have made nonsense of the efforts of the Code of Conduct Tribunal to hear the allegation on merit and conclude the trial as quickly as possible”. The President further added insult to injury by complaining about the stalling of the trial of the CJN, helped along by lawyers who insist that the orders obtained from the various courts, whether right or wrong are technically valid, and must be obeyed till an appellate Court says otherwise. Strangely, after admitting that this is the correct position of the law, the President asked if this was the right disposition for our nation. The answer is in the question. And any lingering doubts that the motive of the President in swiftly announcing the suspension of the CJN and replacing him Justice Muhammed was not really about the non-declaration of assets, were dispelled by the words of the President himself when he announced his government’s dissatisfaction with, “the alarming rate in which the Supreme Court under the oversight of Justice Walter Onnoghen has serially set free, persons accused of the most dire acts of corruption, often on mere technicalities, and after quite a number of them have been convicted by the trial and appellate courts”. One only needs to refer the President to the immortal words of Obaseki JSC in the case of Ojukwu v Military Governor of Lagos State (1985) where His Lordship held that “the Nigerian Constitution is founded on the rule of law the primary meaning of which is that everything must be done according to law. It means also that government should be conducted within the frame-work of recognized rules and principles which restrict discretionary power which Coke colourfully spoke of as ‘golden and straight metwand of law as opposed to the uncertain and crooked cord of discretion”. Implicit in President Buhari’s statement is the clear expression of his intention to substitute the institutional knowledge of the judiciary particularly the Supreme Court with his personal notion of what is “the right disposition for our nation”. If a President is allowed to remove the head of an independent and constitutionally equal arm of government because he is dissatisfied with the fact that the judiciary was releasing accused persons to walk free, what is the limit to what he or indeed future Presidents can do? What is perhaps most shameful about this entire episode is not even the actions of the President or the ill-advice of his handlers but the various utterances from very senior lawyers who for explicable reasons have justified this desecration of the temple of justice. They say that history is written by the winner. In generations to come, our children will either read that a fearless President successfully fought corruption to a standstill in Nigeria with the help of some senior lawyers or that a when tyrannical President sought to subdue and intimidate the judicial arm of government, well-meaning Nigerians stood to be counted. I have taken sides today. I only hope I am in the right.